Lang Entertainment Group’s theatrical ventures are chosen with two major factors in mind: entertainment value and profitability. They are financed using a commercial investment model. We consider the people that support our projects financially our Producing Partners in the business of our show – because it is much more than an investment. We are creating a product together. And as the saying goes, it takes a village. We work with everyone from savvy investment bankers to those just entering the exhilarating world of live theatre. We are just as eager to educate our Producing Partners, as we are to learn from them.Typically, theatrical investments are made in “units.” For one of our Off Broadway shows, a unit can start at approximately $5,000. For Broadway, a unit can be $10,000 to $25,000. Sometimes it is possible to share a unit with another individual or company. And for those interested in having a more substantial involvement in the production, there are opportunities to be Associate Producers and Producers by bringing on board your own Producing Partners. Special VIP house seats (the best seats in the house) for purchase at regular box office prices~ Special discounted tickets for your family and friends~ Status reports from the Producer and General Manager on the show’s activities and financials~ Assistance from the Producer’s office in arranging theatre parties, making recommendations, etc. If you are interested in becoming a Producing Partner on a Lang Entertainment Group project, please contact Victoria Lang at Victoria@LangEntertainmentGroup.com to arrange a personal meeting. According to the Broadway League….. The 2016/17 Broadway season box office grosses rose 5.5% – to $1.45 billion – a new record high. Broadway attendance is surging due to a large increase in tourism. 13.2 milliion people attended a Broadway show in the 2016/17 season. Broadway audiences have grown annually over the past 5 seasons by more than 15%. 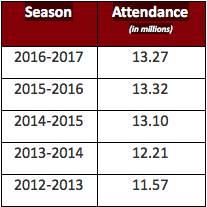 Tickets are selling at a record-setting pace, with grosses for the 2017/18 season reaching $327 million as of July 31st, 2017….a 20.5% increase over sales for the same period last season. Broadway attendance has topped those of the 10 professional New York and New Jersey sports teams combined, by over 2.6 million seats. Broadway shows could be more lucrative than sponsoring sports teams.